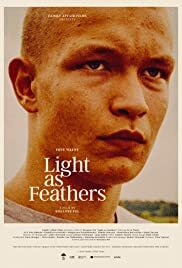 LIGHT AS FEATHERS is heavy family drama done minimalist style with the audience left to interpret the incidents happening on screen as to cause and effect. The film’s setting is a Polish village with the characters speaking Polish despite the film being a Dutch production. The film centres around a young impressionable youth Eryk (Eryk Walny) who lives with with his dissatisfied mother (she complains about how life is leading her nowhere at the start of the film), Ewa (Ewa Makuula) and grandmother in a Polish village. Eryk plays rough games like wrestling with the other boys while having his neighbour Klaudia (Klaudia Przybylska) as his girlfriend. Things are not going too well with the family especially for Eryk – no ambition, no career guidance and no male role model. Things come to a boil when Eryk gets Klaudia pregnant. Pel’s film is brutal too watch with some mean dialogue spoken as well. Mother to Eryk” “I regret giving birth to you.” Pel gets her message of youth confusion across but does not offer any solutions. Eryck is at least showing signs of maturity towards the film’s end.